Struggling with those New Year resolutions? Feeling disheartened, guilt-ridden or have a serious case of the January blues? You’re not alone. Read on to discover how to lift your spirits, boost your mood and keep your health on track this year. With all the hullabaloo of Christmas out of the way, and with spring still a distant dream, this time of year can be tough. Add to that the physical (and financial) hangover from an indulgent festive season and it’s no wonder the promise of a “wipe-the-slate-clean” drastic detox or exercise programme can seem alluring. However, the promised land of virtuous clean living often comes with a downside. If you’re feeling not-so-great about yourself it can be tempting to set unrealistically high targets. And if you’re a natural list-maker and prone to a monkey mind (like me! ), this can amplify the issue. Give up [insert chosen vice here] – sure, I can do that for a whole year! Take up running every morning? No problem! Lose two stone in a month? Count me in! I’m being a little flippant of course, but I’m sure we’re all familiar with that comforting feeling that we can “remake ourselves” in a month and undo our past excesses (perceived or real). Now, having goals is a really good thing – without them it would be a struggle to get anything done and they can lead to truly great achievements. The problem is those unrealistic targets that you know deep-down are setting you up for a fail. Those ones that, when life gets in the way and you realise you can’t keep up with only surviving on salads or flogging it out at the gym every day, trigger feelings of failure and send you on a spiral of guilt, shame and self-loathing. The traditional January detox is a good example. Making up for all your festive food sins with a few weeks of “clean eating” or by popping some fancy tea or supplement is very enticing (just ask the very profitable industry that pushes these ideals). However, quick fix restrictive diets or cleanses often have very little scientific evidence to support them, and when not properly implemented can leave you feeling worse than when you started. Cutting out whole food groups or relying on juices or smoothies without the proper support can also play havoc with your blood sugar, leaving you feeling drained, sluggish and on an emotional roller coaster. Not very fun, and certainly not good for your stress levels and mental wellbeing. Detoxification is a real process, but the truth is it is happening in your body 24 hours a day, 365 days a year. Rather than being a January fad, it is a way for your system to deal with all the chemicals, processed foods, pollutants, bacteria, pesticides and other potentially harmful substances it is exposed to on a daily basis. However, suddenly cutting out key nutrients from your diet (which often happens when you embark on a restrictive eating plan) can actually put more strain on your detox system in the short term, leading to low energy, poor mood and higher stress levels. So, this year, why not try something a little different? Rather than jump back on the merry-go-round of tough resolutions and guilt spirals, set intentions instead. Think of intention as resolution’s more balanced, less assuming sister – with hidden superpowers. While it might not have the glitz and glamour of a lofty resolution, an intention can still programme your internal SatNav so you have something to aim for, but on the days when life just gets a bit too much, you can avoid the shame game. That equals a much greater chance of success in the long term. 1. 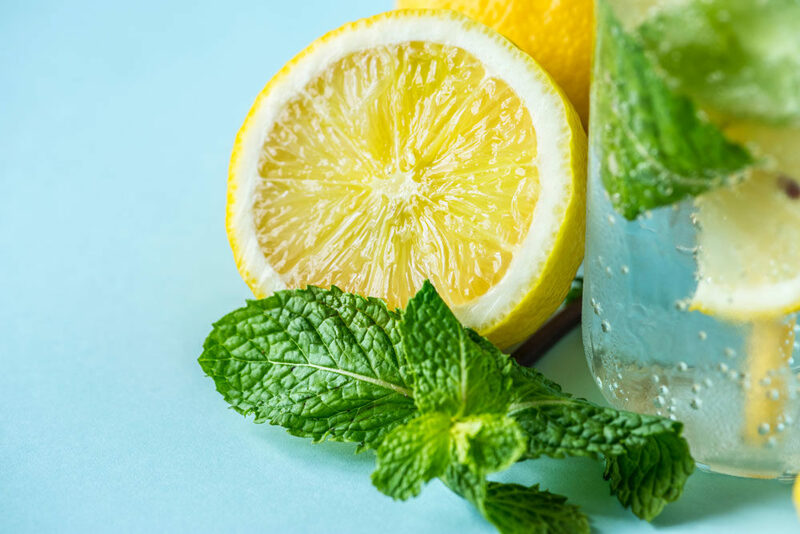 Start the day with hot water and lemon: A mug of hot water with a squeeze of fresh lemon or some fresh ginger is a great way to gently wake up your body and boost your energy. 2. Eat a rainbow: Aim to make every meal look as colourful as possible by including a range of different vegetables. Not only does this liven up your plate, it also ensures you are eating a range of phytonutrients, plant chemicals that help to protect your immune system (good-bye January cold!) and your brain health. I like to tell my clients to “eat a rainbow” every day. 3. Season foods with fresh or dried herbs and spices: Use turmeric, cumin, cinnamon, parsley, dill, rosemary, thyme, mint and coriander to support your liver and gut, combat inflammation and add flavour to foods. 4. Focus on fresh, whole foods: Avoid anything with a long ingredients list. Even the so-called “health foods” usually have hidden sugars and preservatives which can disrupt blood sugar, affect your mood and increase cravings. Instead of that “healthy” snack bar, choose a whole piece of fruit and a handful of nuts. Likewise, a bit of real butter or ghee is a better option than a synthetic spread or margarine. 5. Move your body every day: This stimulates the lymphatic system (key to helping your body eliminate toxins), supports healthy digestion and boosts serotonin (the happy hormone). Find something you enjoy – whether that be walking in the park, yoga, tai chi, cycling, dancing or even gardening. Anything that gets you moving and doesn’t feel like a punishment. 6. Choose locally grown and/or organic foods where possible: This can help take the burden off your body as well as being kinder to the environment. The chemicals, synthetic hormones and antibiotics contained in traditionally farmed foods can disrupt hormone balance, leading to low mood, difficulty losing weight and poor sleep. A local veg box delivery can help with costs and save time. 7. Start a gratitude journal: Spending just a few minutes every day thinking about what has gone well or what makes you smile can help to reset that mental SatNav to a more positive mindset. Over time, this can have a profound effect on mood and well-being. 8. Set time aside on a regular basis for friends and loved ones: Our technology-driven world can feel quite isolating at times, so making an effort to actually speak to or see those you care about (not just text or email) helps to boost dopamine levels and lower stress. If you feel you’re struggling and need a helping hand to get you back on the path to lasting health, I’m offering a limited number of 45-minute “Mood & Energy Boost” consultations on Friday 1st February and Saturday 2nd February at Brighter Spaces Islington, for the very special price of £29. There are only a few places left so please contact me to book your place. Make this the year of nourishment, not punishment.